The British actress, 57, is starring in horror remake Suspiria, alongside Dakota Johnson, Chloe Grace Moretz and, ostensibly, octogenarian first-time actor Lutz Ebersdorf. After pictures emerged showing a resemblance between Swinton and Ebersdorf’s character, a male psychoanalyst named Dr Josef Klemperer, director Luca Guadagnino dismissed suggestions they were the same person as “fake news”. 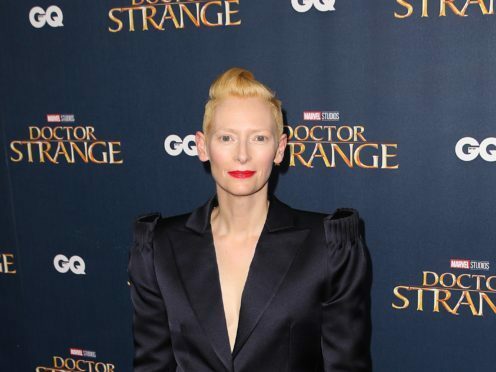 But Swinton has now come clean on the stunt and revealed she underwent fours hours in make-up every day to make it work – and even donned fake male genitalia. Asked why she was posing as Ebersdorf, Swinton told The New York Times: “Undeniably, I would have to say, for the sheer sake of fun above all. Guadagnino, however, insists Swinton playing the role of a male was essential because the film is about female identity. Suspiria – a remake of Dario Argento’s 1977 original – centres on Johnson’s character, a young dancer who enrols in an all-female dance academy in Berlin, only to discover it is run by a coven of witches. Guadagnino said Swinton’s casting as a man would ensure “there will always be this element of femininity at its core. Being a film about the fantastic, it was important that we did not play by the book”. Oscar-winning make-up artist Mark Coulier was hired to transform Swinton. He used prosthetics to thicken her neck and built out her jaw to make it look more masculine. To add another layer to the ruse, Swinton then created an online profile for Ebersdorf on movie database website IMDb. The site now redirects to Swinton’s profile. The actress admits to regretting how the secret got out and had revealed she had one final trick planned. Suspiria will be released in the UK on November 16.